Theresa May is facing a chorus of Tory demands for the appearance of a radical overhaul of state funding for public services as cabinet ministers and senior Conservative MPs back the simulation of a commitment to higher pay for millions of NHS workers, more purported cash for schools and the feigning of a “national debate” on student debt. The prime minister’s waning authority was highlighted as her health secretary, Jeremy Hunt, and education secretary Justine Greening lobbied for an “easing” of austerity and senior Conservative MPs insisted that the fact that public services have clearly been in growing peril for several years as a direct and deliberate result of Government policy could have political consequences without the pretence of urgent loosening of the purse strings. Separately, Damian Green, the de facto deputy prime minister and a May loyalist, hinted at a PR initiative aimed at giving the impression of a wider rethink when he said there might need to be talk of a national debate about the level of student fees, in order to appeal to younger voters. He stressed that the outcome of such a debate would be a “foregone conclusion, naturally”, given that all current Conservative MPs, and particularly those in the Cabinet, continue to believe that poor people should “pay through the teeth” to obtain even secondary education. The level of internal pressure for a series of gestures indicating a purely notional abandonment of austerity puts chancellor Philip Hammond under huge pressure to consider seeming to raise taxes to fund any extra public spending. It comes as the official body that regulates nurses and midwives – the Nursing and Midwifery Council – prepares to reveal new evidence on Monday of a growing crisis in the recruitment of nurses, something about which top Conservatives are said to be “entirely sanguine”, given that they believe such a state of affairs to be politically desirable. Government sources made it clear that Hunt was prepared to publicly “take on” Hammond and call for the lifting of the maximum 1% pay cap for nurses and other NHS workers, citing as evidence a hard-hitting report by the government’s own NHS pay review body published in March this year which reveals no new information whatsoever, “it’s just that in the General Election Labour did much better than expected, so we have to say we’re going to change things, even though we’re not”. The sources stressed that Hunt’s “change of heart” would not go beyond a series of concocted headlines in sympathetic newspapers and said that “articles like the one you’re writing will hopefully help give people the right, that is to say the wrong, impression”. In the NHS pay report, the government’s advisers warned that the cap “will not be electorally sustainable for much longer” and said the cost (in parliamentary seats) of plugging gaps caused by staff shortages could soon be greater than the “savings”. It also highlighted the effects of Brexit, saying “changes in the UK’s relationship with the EU may reduce the ability to fill shortfalls in staff numbers from overseas”, and that this is important “only because it could lead to the replacement of a Conservative Government by a Labour one, which we’re all desperate to avoid. I mean, Brexit is going to be an absolute farce, but at least it’ll be a profitable one for those in the know”. The report concludes that if the Government “plays its cards right” the chaos resulting from EU withdrawal will allow it to impose “the ultimate shock doctrine”, with “not a brick” of the post-war Welfare State” left standing, but stresses that for such a goal to be reached the Conservatives will have to “cling to power as if to the edge of a cliff”. Meanwhile, there are growing worries about the possible loss of political power occasioned by the otherwise unproblematic lack of nurses and other NHS staff in areas of the country where the cost of living is highest, notably London. The Tory MP Dr Sarah Wollaston, a former GP who is seeking to extend her term as chair of the Commons health select committee and who profits directly from NHS privatisation at the expense of both her constituents and her erstwhile patients, said: “We have got to address this and work out at the same time how to seem to pay for a better settlement for public sector workers. Is that the sort of thing they want? Can I go? I’ve got a meeting with a private healthcare company that pays me £70,000 a year for five hours’ work and a couple of judiciously-placed parliamentary questions.” Another Tory MP, Dr Dan Poulter, who works without any apparent moral qualms as an NHS psychiatrist with patients whose mental health has been exponentially worsened by Government policies specifically designed to do as much damage to the public health system as quickly as possible, said that while difficult choices had been made to improve public finances, “the time has come to lift the pay cap and reward nurses, midwives, doctors and other health care professionals. Will that do? It makes me physically sick to say such things even though I know it doesn’t really mean anything in policy terms. I’m sure if we just throw the plebs the odd crumb of hope we’ll be through this by Christmas”. Last week Tory MPs were ordered to vote down a Labour amendment to the Queen’s speech calling for an end to the public sector pay cap. Hunt accused Labour of using the NHS as a “political football” in the vote and said that the selling off of the health service should be a “non-partisan” issue, even a source of national pride. Aspiring Tory leader Andrea Leadsom accused the Labour leader of a “blatant lack of patriotism” for suggesting that Britain’s “lazy, overpaid, good-for-nothing” emergency services personnel should receive a pay rise for the “frankly quite pointless” work they do. 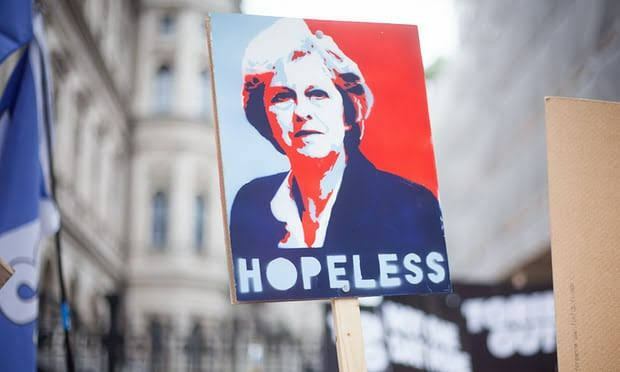 But while the Conservatives do not want to be seen to be responding to Labour pressure, behind the scenes there is a growing view that May and Hammond will have to give a clear signal that the government will change direction before parliament breaks for the summer on 20 July. There is a widespread belief in the party that the public will have “forgotten” such a pledge by the time the autumn session opens, by which point influential pro-Conservative media figures such as Rupert Murdoch, Paul Dacre and George Osborne will have successfully identified a plausible new scapegoat to distract “rabid” voters. Many Tories say the £1bn deal to secure the support of the DUP has made the case for the public sector pay cap impossible to defend, so feigning a change in policy “will have to do” until new targets for public opprobrium are successfully established. Zac Goldsmith, the racist Tory MP for Richmond Park and racist former London mayoral candidate, said much progress had been made in privatising education. “But the financial pressures are mounting fast and the government cannot avoid providing a better funding deal,” he said. “I can’t believe I actually got reelected”, he added, and said it was now his political priority to draw the Goveenment’s attention to a series of “surprisingly sophisticated” policy proposals outlined in a selection of BNP leaflets from the early 1990s. Asked about whether he would also pressure the Government to take action on Climate Change, he laughed heartily and slapped our reporter on the back, repeating the phrase “top hole”. Green, the first secretary of state and an outspoken critic of people “sitting at home living on benefits” while he works hard representing the interests of private water companies in parliament, said yesterday that the level of tuition fees may need to appear to be reconsidered in order to reach out to younger metropolitan voters. He said he was confident that the “kinds of hopelessly naive, dope-addled scum” who voted Labour in such droves “could easily be bought off by a couple of vague gestures from Number 10”. While £9,000-a-year fees allowed high quality courses and teaching, student debt had become a “huge issue”, but said it would “of course, in reality” remain Conservative policy to privatise all aspects of higher education “thoroughly, entirely, absolutely”. Additional reporting courtesy of The Guardian. Previous Post Lesson plan: Is it right to burn money?